This is a super effect where the Magician has a member of the audience thoroughly shuffle the cards, cut the pack into two piles and choose any one of the packs. 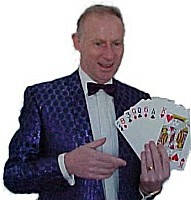 After a "do-as-I-do" routine the audience mamber has placed two cards in two different pockets and in an amazing and very amusing way the magician reveals the cards' names..
WITH any pack, after it has been well shuffled by a member of the audience, secretly sight the two top cards. Riffle shuffle retaining these cards on the top. Then put the pack down and have a spectator cut it at about the middle and lay the two packets side by side. Invite him to touch one of the packets. Whichever one he touches, interpret his choice so that he gets the one with the two cards you have noted on top. Tell him to do just as you do. Take the bottom card and put it in the center of your heap. He does the same. Put the top card in your right-hand pocket. He does the same. Put the bottom card in the middle and the top card in your left-hand pocket. He does the same. Lastly put the top and bottom cards in the middle. He follows suit. You say,"It is a most peculiar thing, but through some strange sympathy that exists amongst the cards, the one in my right-hand pocket will indicate to me what the card in your right-hand pocket is, and the one in my left pocket will tell me what the one in your left-hand pocket happens to be." Take out the card from your right pocket, show it and then deducing from it any plausible or fanciful reason, name the card in his right-hand pocket. Do the same with the other cards. You can make this effect really amusing by making the explanation of your deduction some long-winded ridiculously complicated and funny saga. The putting of the cards from the bottom to the middle is merely to confuse and misdirect the spectator.